If you use Bronto for marketing emails, you can now send loyalty program related emails through your Bronto account instead of through Zinrelo. By integrating Zinrelo and your Bronto account, you can start including loyalty program information in your regular marketing emails, manage unsubscribes in a single place and leverage Bronto's capabilities to set up workflows for better customer engagement. This article explains the steps you need to take to integrate Zinrelo and Bronto. You will see the SOAP API access tokens section and an option to add a new access token. 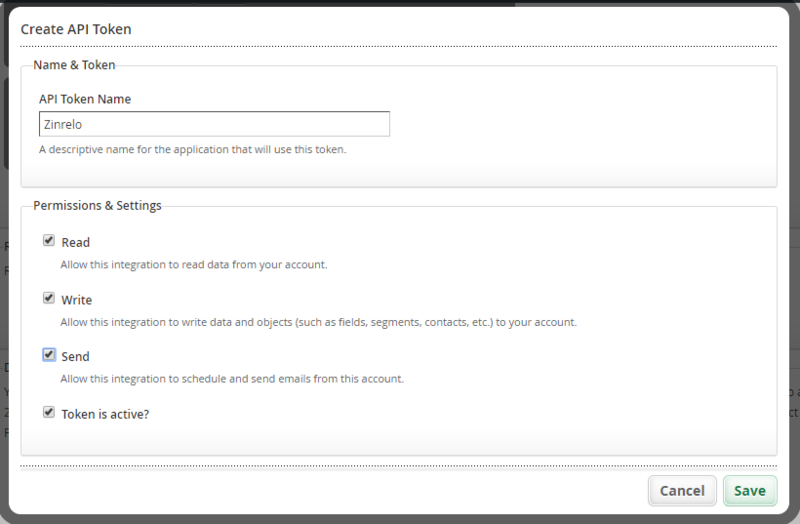 Click the 'Add Access Token' button to create a new token for the Zinrelo integration. Give a name to your access token and enable all permissions and then click save. The access token will be generated and you will see the newly created token on your screen. Note the token number. You will need to enter this in the Zinrelo console. You can always look up the token number in your Bronto account later. 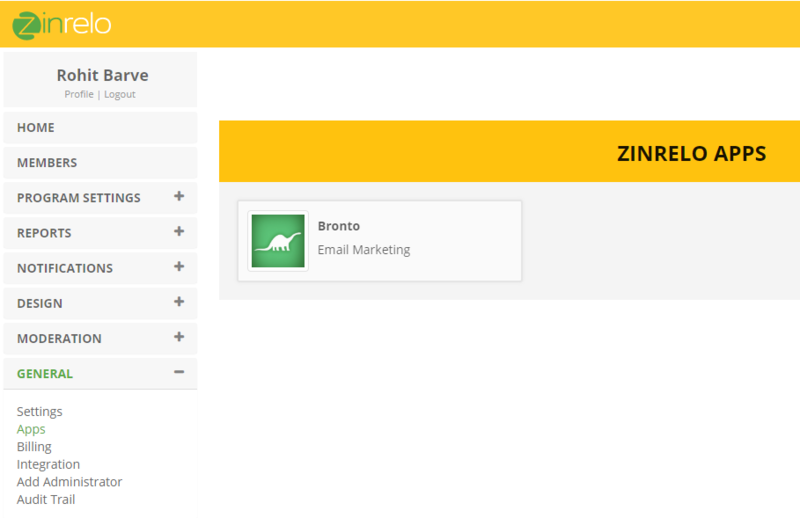 Login to your Zinrelo account and navigate to Settings >> Apps >> Bronto. Update the Access token generated in the previous step in Zinrelo. A list of fields pertaining to each member will be created in Bronto. Whenever these fields are updated in Zinrelo, they will automatically be updated in Bronto. For the initial push, the data should be exported from Zinrelo and uploaded manually to Bronto. Two lists are automatically created in Bronto - zinrelo_referral_list and zinrelo_loyalty_list. The referral list consists of only the friends who have been referred by existing members in the loyalty program. Since these friends have not opted in for any communication and we only want to send an invitation email on behalf of the member who referred the friend, we may want to treat the contacts differently in Bronto. For this reason, we create a separate list for referrals and a separate list for enrolled members. These lists can be accessed from your Bronto admin >> Contacts >> Lists. New events will be created in Bronto that map to Zinrelo triggers for sending out emails. Note: When you update the access token, Zinrelo emails will be disabled. Please set up the Bronto email workflows before updating the access token in Zinrelo. 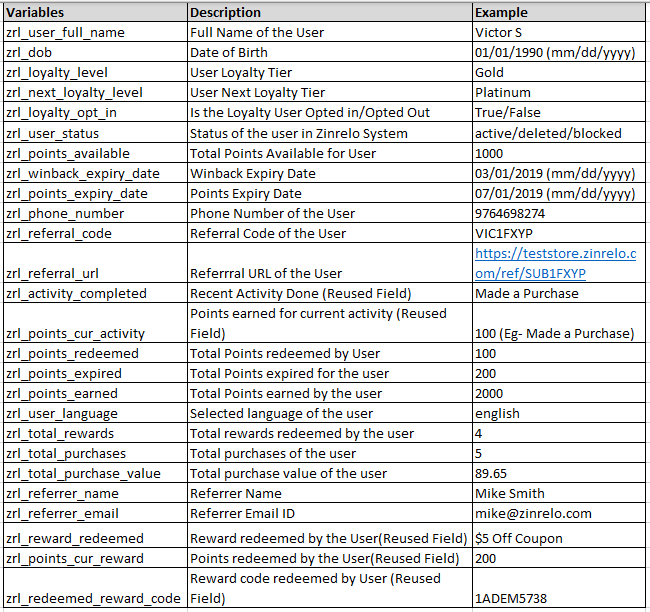 Once the integration is done, there are two types of emails about the loyalty program that can be sent through Bronto. Regular marketing emails that include some information about the loyalty program such as available points, current tier, referral link, etc. Emails that are specifically sent to communicate certain events within the loyalty program such as points earned, points approaching expiry, etc. Example: To include the customer's available points, you should use %%zrl_points_available%% in your email. This variable in your template will be replaced by each user's available loyalty points. A list of event triggers is created in Bronto through the integration with Zinrelo. To use these triggers to send out emails, you need to create workflows in Bronto. 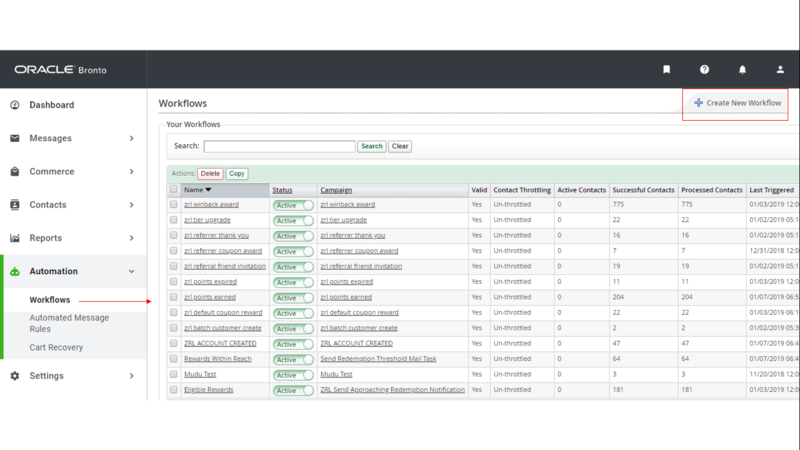 Login to your Bronto account and navigate to Automation >> Workflows >> Create New Workflow. 3. Select the trigger 'Received API Event'. 4. 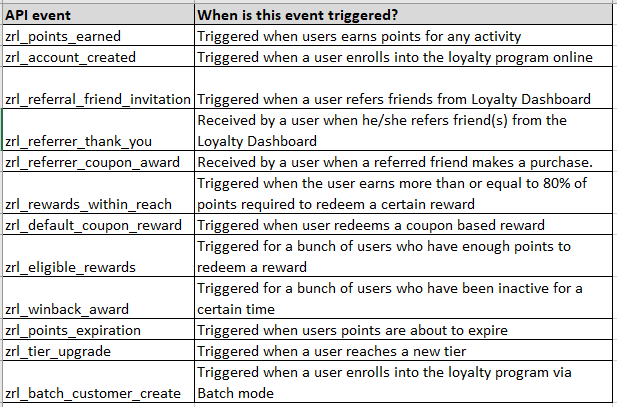 Update the relevant trigger keyword from the list of Zinrelo events. 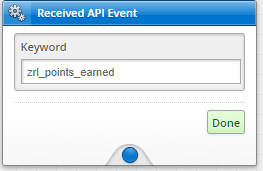 To send out an email when a customer earns points you would use the zrl_points_earned keyword. 5. Drag the 'Send Email' action in your workflow and connect the Received API node to the Send Email node. Configure the 'Send Email' action node. Now that you know how to send out loyalty program emails through Bronto, here is a list of emails we recommend setting up. Email to members soliciting referrals: Periodically, you can solicit referrals from your customers by asking them to share their unique referral link with friends. To update the referral link in emails, you can use the field %%zrl_referral_url%% in your Bronto template. Email Invitation to Friends: Members can also refer friends through the refer-a-friend activity in the loyalty dashboard. In these cases, they have an option to update their friend email addresses in the dashboard and an email is supposed to be sent to the friend on behalf of the member. To set this up, you can create a workflow that listens to the zrl_friend_invitation_event and sends out the invitation email to the friend from Bronto. The invitation email template can reference the referrer details through the fields %%zrl_referred_by%% and %%zrl_referred_friend_email%%. Rewards reminder: It is always a good idea to remind members about the rewards that they are eligible for. Zinrelo will trigger the event zrl_eligible_rewards once a month for all customers who are eligible for any of the rewards in the program. You can either use this trigger or set up your own workflows that remind customers from time to time about the rewards that they are eligible for. Note: The exact list of rewards for each customer will not be available in Bronto. So you may have to setup multiple filter conditions based on the available points to decide which email is sent to the customer. For example, if a customer has 1400 available points, the email should only show the rewards that are available for lesser than 1400 points. Whenever the reward structure in Zinrelo is updated, the email filters will have to be updated as well. Reward acknowledgement: After a member has successfully redeemed a reward, Zinrelo will send the zrl_default_coupon_reward trigger. The corresponding email template can include the following fields. %%zrl_redeemed_reward_code%% to show the coupon code issued. Points earned email: Whenever members earn points for any activity, Zinrelo will trigger the zrl_points_earned event. The email template can use the following variables. %%zrl_activity_completed%% to show the activity for which points were earned. %%zrl_points_available%% to show available points. Based on the available points if eligible rewards can be communicated in the same email, the engagement will be higher. Points expiration: Based on the expiration settings in Zinrelo, Zinrelo will trigger the zrl_points_expiration event. Members can be notified about the approaching expiry date by using the variable %%zrl_points_expiry_date%%. This date is always in the UTC timezone. Win-back email: Zinrelo has a built-in win-back activity, where inactive members are identified and a win-back offer is rolled out to them. The trigger to send out the email is the zrl_winback_award event. The win-back offer usually is a fixed number of bonus points and the offer has a limited validity. To communicate the date till which the offer is valid use the variable %%zrl_winback_expiry_date%%. Tier upgrade email: Whenever members move up to a higher tier, Zinrelo will trigger the event zrl_tier_upgrade. Let the members know the benefits that they have unlocked as part of the higher tier. The workflow should include a separate email for each tier. The user tier can be checked in the filters using the field zrl_loyalty_level. At the time of upgrade this field will be updated to the new tier.